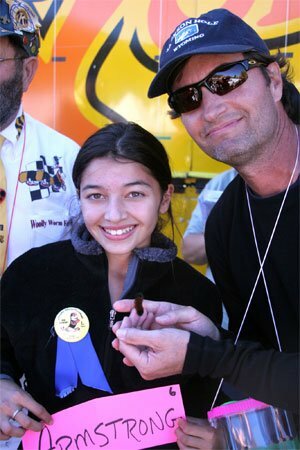 When Jim Morton first put a blade of grass in front of a woolly worm, he had no idea that the fuzzy critter at his feet would lead to a festival that draws nearly 20,000 people, 160 vendors, 1,000 worm trainers, and national media crews to the town of Banner Elk. 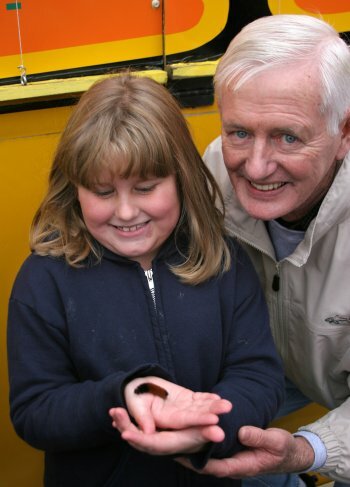 Morton was one of the founders of the Woolly Worm Festival. "October of 1973 was my first autumn in this area," says Morton. "That was when I first learned about the woolly worm’s role in local folklore. A gentleman who worked at Grandfather Mountain told me about woolly worms being used to forecast winter". Morton, always interested in area lore, tucked the knowledge into the back of his mind. 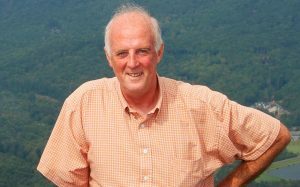 “Some years later, I was invited to a meeting where they were trying to get some ideas together to possibly form a merchant’s association in Banner Elk. It was a preliminary gathering. I was not a merchant, but I accepted the invitation to go to the meeting. 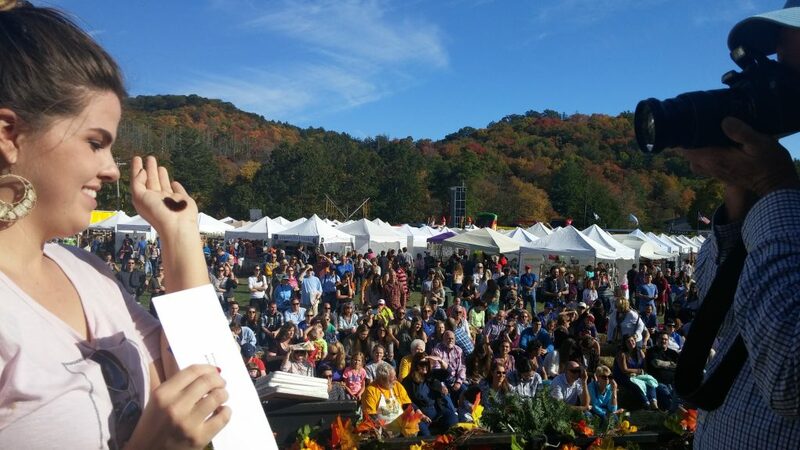 I told the people who were there that I thought Banner Elk would benefit by having an annual event of some type. I know, at Grandfather Mountain, the Highland Games and Singing on the Mountain were very important to our publicity efforts. “The day before the meeting, I had done a woolly worm publication that I worked for. I’d done the forecast using the very first worm that I found that year because we were getting close to deadline. When I finally found a woolly worm, it was completely brown from end to end. Fate then took a role as Morton was reminded of the worm. “I come home from this meeting, and right there on my porch was another woolly worm with a lot of black on it, and only a minimal amount of brown.” Morton then realized that when you forecast with woolly worms, you don’t know which worm to trust. Morton says that a Woolly Worm Festival Association was formed, since there was no chamber of commerce. Contributing merchants chipped in money to have posters printed, and the Festival Association sponsored it for the first six years. There were only three to four vendors, a far cry from the current 160. “It was a small event, but everybody seemed to have a really good time,” says Morton. The first event also spawned a tradition of the festival being featured somewhere in the national media. WCYB TV sent a camera crew to cover the event, and the footage was picked up and run on NBC News nationwide. That publicity jump-started the event, and 300 to 400 people turned out the next year, even though it was raining. C.J. Underwood from Channel 3 in Charlotte came up to serve as Master of Ceremonies. Though the event kept growing, it didn’t turn a profit until the Avery/Banner Elk Area Chamber of Commerce and the Kiwanis Club took over operation in the seventh year. Morton also conceived of the method of racing the worms, because when he was trying to collect a worm, he was “scared to pick it up” because he thought it might sting him. So he plucked a blade of grass and set it in front of the worm and the worm proceeded to climb the blade of grass. He then discovered that the worms would climb a string if they were in the moving mood. They didn’t seem particularly motivated to race across a flat surface. The woolly worm race is three feet of nylon from mark to mark. There’s as many theories about what makes a good-running worm as there are worm trainers who enter the race. Morton says that larger worms don’t necessarily fare better, and that the true winning talent is this: “It does help to check that your woolly worm has an instinct for climbing string,” he says, with all the wisdom of a man who has seen more than ten thousand worms work their way to the top or fail. “They are moody,” he adds. There’s still one thing that would make the event better, in Morton’s opinion. He’d like to see the winning woolly worm achieve the same weather-predicting stature of the official groundhog, Paxtahawney Phil, who in February determines whether there will be six more weeks of winter. “We want to become even more recognized as the official source of woolly worm predictions,” Morton says. Now the thousands of people who have attended the Festival are happy that they participated because racing Woolly Worms is a total blast!